What time is it? Breakfast time, duh. 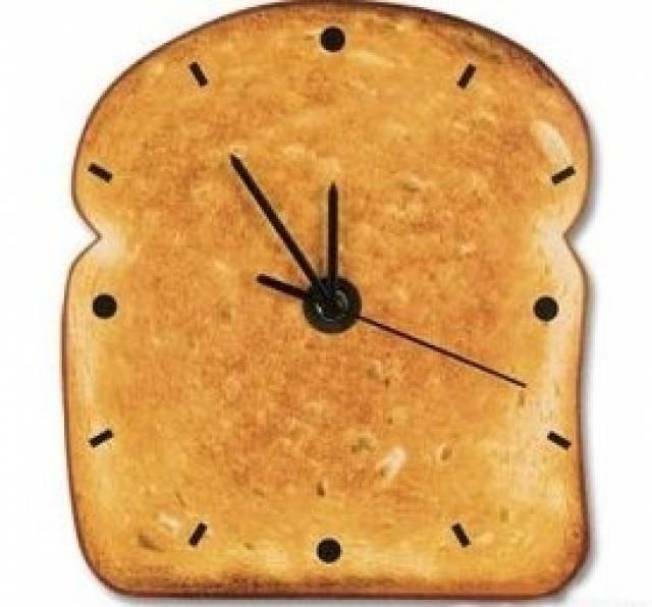 TIME FOR TOAST: Breakfast is always on the brain with this Toast Clock. Keeping track of time – and paying homage to the most important meal of the day – just got a whole lot more fun. Get it at Cutie Gadget. DOG DAYS: These little guys will help you save dollars for a rainy day. Choose from a badass Bulldog or a more dainty Dachshund; either way, you’ll be encouraged to save some coinage. Get it at Pottery Barn. LINKED IN: A glass bowl is so ... wedding registry. A bowl made of recycled bike chain; now we’re talking! Get one at Resource Revival.